I was watching the 2010 Grammys; thus you already know I saw Beyonce's spectacular stage performance: "If I Were a Boy." As I was watching it, I began to consider the fantasy of being male and the dismissal of women, still, here in the early twenty-first century. In the mid-1970s, Laura Mulvey, in "Visual Pleasure and Narrative Cinema," told us we frequently identify with the active, male gaze when we watch films. Females fulfill a largely passive role, the role of "to-be-looked-at-ness." Has that changed much? I wonder. Gwen Stefani sings, "I'm just a girl." Governor of California Arnold Schwarzenegger calls inadequate Sacramento legislators "girly men." Homosexuals were upset? My thought: what about little girls? This remark reduces them to lesser, not strong, not respected. The role of women is reduced to appearance; the narrator is disappointed, even angry. She, only valued for being "pretty and petite." She, with no "rights." Might Beyonce's lyrics also appeal to the flip side of this issue, the fantasy of having power in a gendered world? 'Cause they stick up for me. Here we see the fantasy of belonging to the brotherhood coupled with the fantasy of being on the other side of the double standard. When I watch Casablanca, do I identify with Ilsa? No, like Doane suggests, I travel in masquerade, I become a transvestite, and I align with Rick. Now here I sit in the theater watching The Hurt Locker. I know that only four women in history have been nominated for the Academy Award for Best Director. None have ever won. None have won the DGA award either. That is, until last Saturday night. Last Saturday night. Let's pause and take some time here. Last Saturday night, up against her ex-husband and the director of the highest grossing film in history, Kathryn Bigelow accepted the directing award for her exceptional work. Now we wonder. Can she beat Cameron at the Oscars? Las Vegas says yes, posting her odds at dead even today. Diane Sawyer featured her as Person of the Week in tonight's broadcast. In an interview during the piece, Bigelow said, "I can be a role model and give some young, female filmmaker the impression that the impossible is possible, and that if you're tenacious enough, that you can go to Jordan and shoot in the punishing heat of the summer." 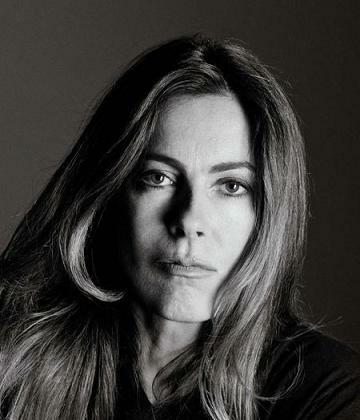 So now I know one more thing about Kathryn Bigelow. She's funny. Pushing past a cluster of anxieties extant in our popular culture: witness Beyonce's lyrics, Gwen's lyrics, the comments of one California governor: Bigelow has bypassed frilly costume dramas, circled around romantic comedies, and now here she stands with a psychological profile of a soldier in her hands, awaiting her place in history.